Dominic Salole, does that name ring a bell? I was benighted before I came across his song Living in the Snow. Best known as Mocky, he worked over the past years with Feist (remember The Reminder? 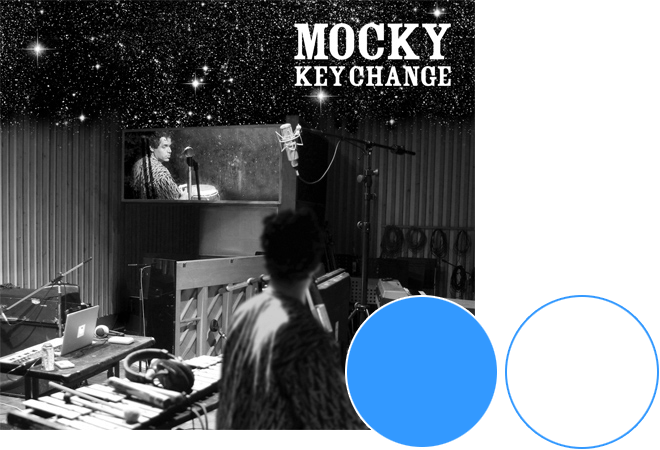 Mocky collaborated on that album), Jamie Liddell, Peaches and Chilly Gonzales. Abandoning his old electronic, funk and hip-hop habits, Mocky now offers acoustic music with a jazz sound quality. The artist has the will to bring to the world’s ears a different sound, a sound unadulterated by modern technology. The Canadian artist kicks off his North American tour this week to present his newest effort, Key Change. He is coming to Montreal this Friday and I recently had the pleasure to talk to him. I listened to Key Change the night before and I was pleasantly conquered. While the phone was ringing, I felt my nerves were about to explode. Indeed, I was about to conduct my first interview. I waited patiently, imagining the worst and then convincing myself that all would be well. What a relief it was when I heard a friendly voice on the other side of the line! Bélinda Bélice (BB): Thank you for taking the time to do this interview. BB: Are you glad to be back in Montreal? M: Oh yeah! I’m so excited to come back to Canada and Montreal and play. It’s great to be home after so many years abroad in Europe, Berlin, and now in L.A. I’m just so excited to bring my music back to my home. BB: Your North American tour kicks off tomorrow. Are you excited? Do you have any expectations? Is it going to be different from your previous tours? M: Yeah, yeah. I’m bringing my quartet from Los Angeles. These are musicians that I’ve been working with in L.A. I’m super excited to share them with the Canadian audiences. I’m going to have a string trio with me on every gig as well. There will also be drums and two percussion players at the same time. BB: You have three acclaimed solo albums and Key Change was very well received. Are success and good reviews important to you? M: Hum, yeah. I’d say that’s very important. As a musician, we try to resonate with our surroundings, whether it’s playing with other musicians or the timing of a release. The hard part in creating a successful album is making sure that people hear it. In today’s market, things are a little bit different – you constantly have to adjust your expectations as to what an album can do. I see the reviews and the positive responses that I’ve been getting and I feel really strongly about this record. Now’s a really great time to be bringing out acoustic music. People are hungry for music that’s not made in a digital domain. I’m really excited to be delivering that. BB: What inspired you during the process of making the album? M: A lot of it is the musicians that I surround myself with. In L.A., there’s just an incredible up and coming sort of underground music scene. It’s been developing in the last year. I came out here to write and produce. It’s turned out that the journey has also become about my own music. The musicians around me inspire me and in turn, I make an album. You know, it’s a really exciting time to be in L.A. I think in the end, it gave me the push to bring out my current album. BB: You were in Berlin before. Do you prefer L.A. or Berlin? M: I love them both. I don’t think it’s necessary to have a preference. Where I currently am in my life, I prefer L.A. I’ve spent nine years in Berlin. I would recommend anyone to go there. It’s a great place to be creative. There’s so much space there. It’s a truly one of a kind social experiment. In my case, I’ve reached a point where I always have to go where the energy is. I started moving away from the clubs. I was going to work in Los Angeles and I found out that there’s so much music going on there. I guess I would then put L.A. before Berlin. BB: Is the title of the album related to the fact that you do acoustic music? M: Yeah, it’s a metaphor for human tension. Key Change is something that happens in the musical arrangments. It takes a human to do that. It takes a human to decide to do key change. It takes a human to mean the key change because of the range of their voice. The album is representing a new beginning. It’s not just about reacting off of a machine. That’s what Key Change represents to me. BB: During the interview with Fader, talking about the song Living In the Snow, you said: “The song is about trusting your instincts over your rational mind which is the act of music making.” Instinct seems important to you. Do you follow your instincts in your life, in what is not related to music? M: Oh, absolutely. In a lot of ways, it was crazy to take a risk and move from Berlin to Los Angeles. I just follow my gut and that’s what leads me to interesting musical moments and history. When people come see my show this Friday at the Resonance Café, they can expect to be up and close with me and my ensemble. There’s a lot of improvisation. We follow our gut. We use that instinctual approach to the music. I’m really really excited to bring it to Montreal. Really, I can’t wait for people to come down. There’s also a really great opening act: Kara-Lis Coverdale. She is a Montreal-based pianist. Make sure you check her out if you don’t know her. BB: I’m attending your show this Friday and this will be the first time I see you live. I’m pretty excited. Well, it was not so bad after all! Happy with this interview, I meditated on the place of the musician in today’s society. There is a human behind all music and we often seem to forget that these days. I am ready for Mocky’s new sound and humane approach to music. I also hope to find all the necessary courage to go say hello. Mockey will play at Cafe Resonance (5171a Parc ave) on July 10 at 9 p.m. $10.